The Global Geoparks Network, the University of the Aegean and the Natural History Museum of the Lesvos Petrified Forest are co-organizing with UNESCO the Intensive Course on Geoparks 2017 “UNESCO Global Geoparks and Geotourism Development”, in Lesvos island, North Aegean Region, Greece, one of the first UNESCO Global Geoparks in the world, from June 12th to 22nd June, 2017. 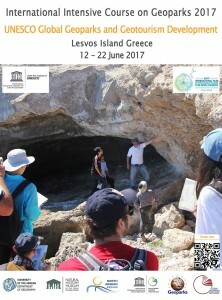 The Intensive Course on Geoparks 2017 aims to focus on the UNESCO Global Geoparks contribution on shared and sustainable outcomes related to tourism – tying sustainability together with community pride and benefit, economic development and new employment as well as geological, natural and cultural heritage conservation. UNESCO Global Geoparks – the innovative sustainable tourism destinations, through broad stakeholder engagement, celebrating the goals of the International Year of Sustainable Tourism 2017, provide a global platform of cooperation for geotourism development supporting local communities cohesion and development world-wide. Through the Intensive Course on Geoparks 2017, the annual capacity building activity of the Global Geoparks Network, attendees will have the opportunity to widen their knowledge and expertise on UNESCO Global Geoparks and Geotourism, to cooperate with different disciplines and countries. The Intensive Course on Geoparks 2017 comprises of theoretical background together with extensive fieldwork. 10 days – 80 hours ‘hands on programme’ distributed as following: 40 hours lectures by top UNESCO and Global Geoparks Network experts, as well as specialists in Geotourism development in theory and practice and 40 hours field training and activities. an Activity Report, long distance assisted work, which shall take place after the end of the course. Participants will gain 5 ECTS credits after successful completion of the Intensive course on Geoparks.